And now for something truly shocking: I have not been hotly anticipating Prometheus like everyone else. Seriously. I've had an interest in it, but a mild one no where near the excitement I feel for other releases this year. So when some of the ho-hum reviews started hitting the blogosphere last week, I can't say I was terribly crestfallen. Since I'm even less excited for next week's release Rock of Ages (thanks to Tom Cruise) I'll wait and check out Prometheus next weekend when I have the day off for my birthday. You may commence with the your hate mail now. 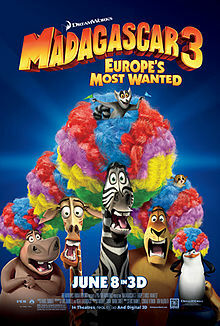 I haven't seen the first two Madagascar films, but since I'm a parent trying to gauge how my preschooler handles different theatrical experiences, there may be another round of Movies with Mia coming up soon. Since I have no actual interest in the film, it might be one more beneficial experiment before Brave in a couple of weeks. No hate mail coming from me on Prometheus ambivalence, however I *do* call issue with being swayed by "ho-hum reviews". Isn't it better to make your own mind up? Oh, I haven't been swayed in the least. Mom and I made plans a couple weeks back to wait till next weekend to see it, and we will. But it seems a lot of people who have been dying to see it have been let down by some of the negative reviews coming from early screenings. I am not one of these people because my hopes haven't been as high as everyone else's all this time. Essentially, I still have the same stance on it I did before, where as some are no longer as excited perhaps that it may not be the second coming of Christ like they were expecting it to be. I'll definitely be seeing it and making up my own mind next week. But you're right - *nothing* will be the second coming, and the sooner people realize that, the happier we'll all be with the movies we watch. Lookin' forward to reading your take on it when you *do* see it!